We live in a culture dominated by the visual. An estimated 90 percent of information transmitted to the brain is visual, some 10 percent of all of the photos ever taken throughout history have occurred in the last 12 months, and there is a camera in almost everyone’s pocket. But against these odds, we should not dismiss our extraordinary hearing capabilities, the result of 300 million years of evolution. In many cases the sophistication of our hearing exceeds that of our sight. Our perception of the soundscape is not limited by field of vision—we can hear things inaccessible to the eye with the ability to identify, with great accuracy, the precise location of sound in 360-degree space. Through hearing, we analyze and interpret the subtly nuanced soundscape. The National Park Service recognizes the importance of preserving park soundscapes, with regulations regarding soundscape preservation dating back to 1916. More recently, management policies were established in 2006 to identify what levels of human-caused sound were acceptable within parks. These directed park managers to (1) measure baseline acoustic conditions and (2) determine which existing or proposed human-made sounds are consistent with park purposes. The NPS has been proactive regarding awareness and preservation of the park soundscapes and has demonstrated great wisdom and vision in the development of policy. However, factors like development and auto traffic endanger park soundscapes, especially in a small, community-interwoven park like Acadia. Further action must be taken to protect and preserve the park’s sonic panoramas. The first soundscape monitoring and analysis in Acadia National Park was done in 2005 by Volpe, part of the US Department of Transportation, to establish baseline ambient sound levels—naturally occurring sound combined with human-produced background noise. Human-produced sound might include aircraft, hikers, campground noises, human conversation, motor vehicles, cell phone ring tones, or electronic hums. In this equation, it is the presence of human-produced sound that stands to dilute and disfigure the naturally occurring soundscape. To determine ambient sound levels, the Volpe team captured 150 days of acoustical data at nine sites throughout the park. That study was followed up in 2013 by a team of research students from Worcester Polytechnic Institute in Massachusetts, drawn from various disciplines such as math, computer science, environmental engineering, robotics, aerospace engineering, electrical engineering, and music. Adhering closely to the technical and procedural methods used by the Volpe team, the WPI team replicated portions of the initial study and carefully compared the results to determine if the ambient sound levels in Acadia National Park had changed over the past eight years. The team concluded that overall ambient sound levels had not changed significantly since 2005; taken at face value, this was an encouraging finding. However, as the team began to analyze their own work in more detail and further compare it with the 2005 study, a discouraging trend began to reveal itself in the data. While the overall ambient sound levels had remained relatively stable throughout the park, the presence of human-produced background sound in many of the study locations was encroaching upon and, in some locations, overtaking the naturally occurring sounds of the park. The WPI team observed that there were no lengthy moments when people did not come in or out of the Cadillac Mountain parking lot, resulting in a predominance of human and automobile noise, including occasional very loud vehicles such as motorcycles. This corroborated the 2007 study, which also observed air tours approximately 9 percent of the time, and commercial jets about 1 percent of the time. Distant hikers, boats, and roadway traffic were audible 64 percent of the time. The natural soundscape, such as wind, birds, and some insects, accounted for 26 percent of the observed sounds at the summit of Cadillac Mountain. Similar results were occurring at other sites within the park. Based on their research, the WPI team concluded that the continued measuring of ambient sound levels should be suspended to allow the focus of the research to shift. 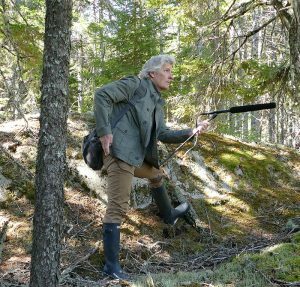 There was now some urgency to begin recording, archiving, preserving, and documenting the natural sounds of Acadia National Park. Working in collaboration with Dr. Abe Miller-Rushing, science coordinator for Acadia, a newly formed 2014 WPI research team began realizing plans for a multi-year project of capturing audio recordings of the soundscapes throughout the park. The WPI team set out to capture the naturally occurring soundscapes of the park including birds, insects, frogs, ocean surf, brooks, and wind blowing through the tress. This pursuit would take the team to the mountain summits, rocky coasts, saltwater marshes, forests, and the carriage roads of the park. The team would then digitally archive the sounds and make them available to scientists, researchers, educators, and others. 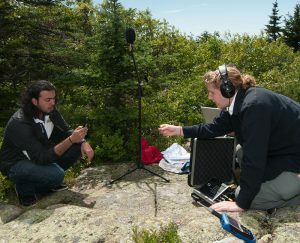 While the project’s goal was to record and archive the sounds of Acadia with technical and scientific accuracy, the WPI team’s vision included capturing aesthetic and artistic qualities of the Acadia soundscapes as a way to heighten awareness of the park’s sonic endangerment. Just as nature can inspire art, art in return can connect us to nature. Making the Acadia’s sounds available for artistic use and interpretation would be analogous to the Hudson River School painters of the mid- 19th century. Working in reaction to the Industrial Revolution and in search of an American identity, they painted land- and seascapes that were the first to use art as a medium to awaken Americans to the hidden wonders and beauty of Mount Desert Island. Through artistic imagery they raised awareness and heightened sensibilities for the appreciation of this wilderness environment. Could a similar awareness be achieved today through sound? Like the Hudson River School painters, many artists are working today as advocates and a voice for the environment. This aesthetic approach dates back to late 1960s and early 70s, when the modern environmental movement provoked artists to respond. They elaborated on issues such as pollution, biodiversity loss, sustainability, climate change, and resource depletion. And as a counterpart to the visual arts movement, the field of acoustic ecology was beginning to emerge around the same time. Acoustic ecology focused on the scientific and artistic nature of sound as a way to study the relationship between living beings and their environment. In our recent book, Environmental Sound Artists (Oxford University Press 2016), my WPI colleague V.J. Manzo and I explore the motivations and activities of many contemporary sound artists and the impact of their work on environmental awareness. These dedicated sound artists are drawn from varied and diverse backgrounds that include music, geophysics, natural sciences, sculpture, philosophy, and art. John Luther Adams, for example, is a composer and winner of the 2014 Pulitzer Prize in Music for his orchestral composition Become Ocean, which was inspired by the oceans of Alaska and the Pacific Northwest. London-based Cheryl Leonard creates sound art by recording melting ice from glaciers in Antarctica. American artist, philosopher, and scientist John Bullitt monitors the seismic vibrations of the earth and creates environmental sound art from the result. Awareness and concern for the environment has unified sound artists around the globe under the umbrella of acoustic ecology. These artists seek to alter our perception and heighten our aesthetic appreciation of the soundscape by persuading us to pay attention to it. Acoustic ecology is important because sound provides information about the world around us, and while that information is sometimes clearly understood through scientific quantification, at other times it is more appropriately expressed through the nuance of art. Sound is a powerful liaison between the environment and the human mind. Sound delivers information that can trigger associations, jump-start the imagination, engage the intellect, and challenge the mind. Through listening, we are reminded not only of the beauty, but of the fragility of the natural soundscape. FREDERICK BIANCHI is a professor and director of computer music research at Worcester Polytechnic Institute (WPI) in Worcester, Massachusetts. He is also the director of WPI’s Bar Harbor, Maine Project Center. Photos: (Top and Bottom) Frederick Bianchi field recording in Acadia National Park. Credit M. Ryan. (Middle) Worcester Polytechnic Institute students Mohammed Alrayas (left) and Andrew Kennedy recording the Acadia soundscape at Blue Hill Overlook on Cadillac Mountain. Credit Michele Stapleton.